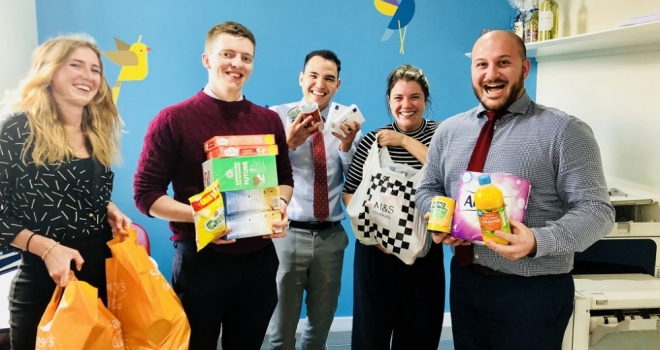 Property industry charity Agents Giving is continuing its support of The Trussell Trust, to encourage agents and suppliers to support and help combat poverty. Every day across the UK foodbank managers are supporting Mums and Dads in crisis with food parcels and baby essentials. It’s natural that most people think of food items when collecting for their local foodbank but it is also toiletries and hygiene products which are also extremely important. Other important items are baby supplies such as nappies, baby wipes, toiletries and baby food to help expectant mothers in need. Please consider donating a baby bath of these essential items to a new mother in desperate need of baby basics to help prepare for the arrival of their little one. Paramount in West Hampstead are a driving force in supporting their local foodbank using their office as a collection point for donations and have organized countless events of all descriptions to raise much needed funds, supplies and donation for the Brent Foodbank. Please check with your local foodbank the baby items they are in most need of, collect them up and make the donation. Your office could also act as a collection point for any baby donations. New mothers can welcome their baby into the world with our help and support. For full information on how to get involved with this initiative, please visit the Agents Giving website agentsgiving.org to find your local foodbank and support this great initiative.